These simple stars make the swirls on this cupcake stand out. 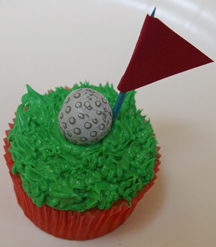 Serve these at birthday party or any celebration. What You Need: 1 cupcake; white frosting; metal 1M swirl tip and pastry bag; large “confetti” star sprinkles (These are by Wilton). How to Make It: Use pastry bag and 1M tip to make swirl. 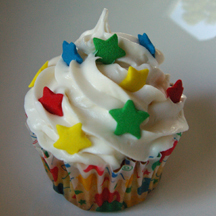 Sprinkle, or strategically place, stars on the cupcake. That’s it! 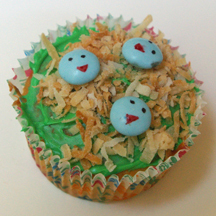 These easy butterfly cupcakes can be as simple or as ornate as you want. Just decorate the Necco wafer wings with sprinkles and piped icing. What You Need: 1 cupcake; yellow frosting; 5 cinnamon imperials (red hots); 4 purple Necco wafers (or any color you’d like); 2 small strands stiff black licorice. How to Make It: Frost cupcake. 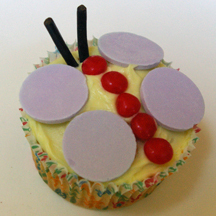 Arrange red hots in a line in the center of the cupcake Arrange 2 Necco wafers on each side for wings. Poke 2 licorice strands into “head” for antennae.